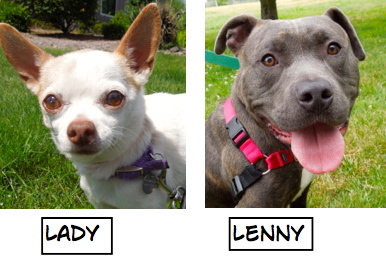 It’s been a very busy week at the shelter. Last Friday a newly arrived puppy tested positive for canine parvovirus, a highly contagious bug. This meant that all dogs who had been near the puppy were quarantined and all shelter dog areas inside and out were deep cleaned. Yesterday the thirteen quarantined dogs were tested to see if they had adequate antibodies to protect them against canine parvovirus and canine distemper virus. 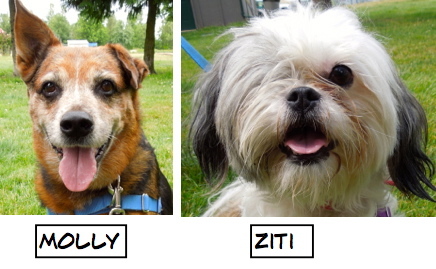 Out of the 13 dogs, 6 of them passed the test and are now adoptable again. The rest will remain in quarantine to be monitored until July 13. 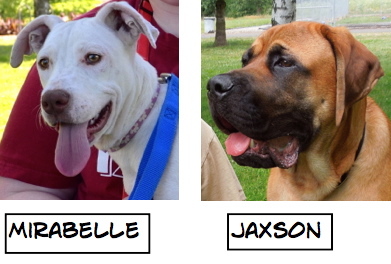 We still had some wonderful adoptions during the past week of dogs who were not quarantined. 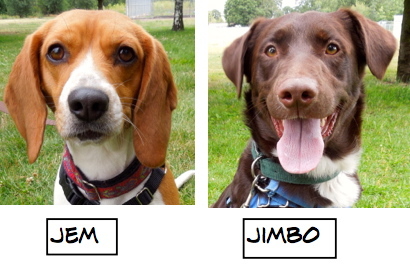 Because of the quarantine, there was no play group on Sunday, so no chatter this week. I’m hoping to have adventures with a new family! I’m ready! The first dog I saw being walked this afternoon by Emelynn was Beefy, a one-year-old Pit Bull Terrier mix who is a very energetic young boy. He’s hoping for a family who wants to have adventures, as he is ready for anything fun. Beefy has lived an indoor/outdoor life and still needs a little work on his house training as well as polite leash walking. 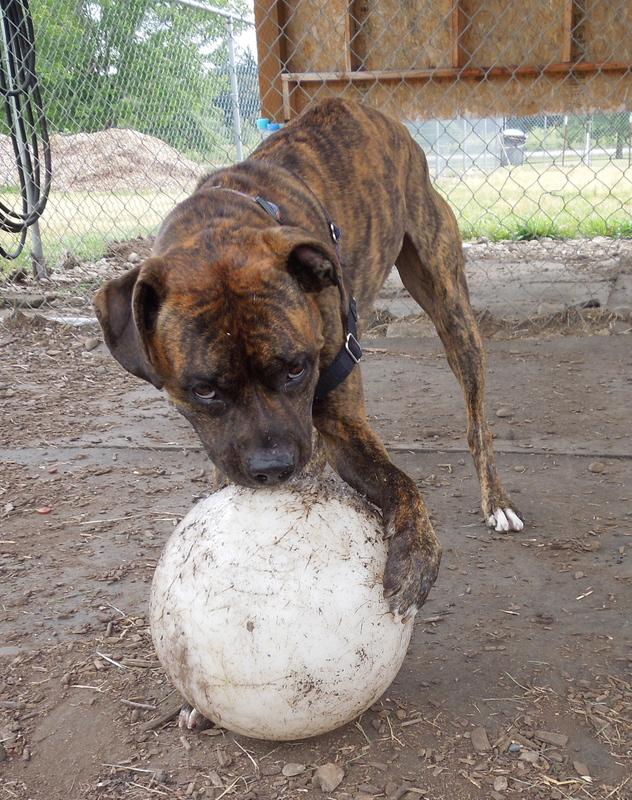 He gets along with most other dogs, but would need to meet any he would be living with, as he can be a little pushy. He’ll do best with older kids. He has a great smile and is very friendly. He loved my hot dog bits and posed happily as I snapped away. So you want a “Ball Dog” for your family? Pick ME! 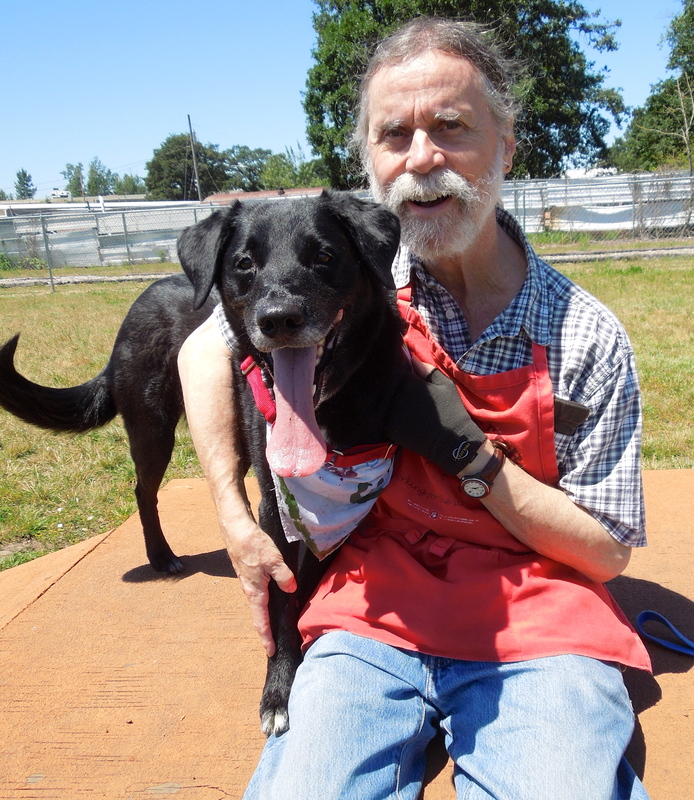 Rudy spent time with volunteer Steve out in the big yard today. Both Steve and Rudy loved their time together. 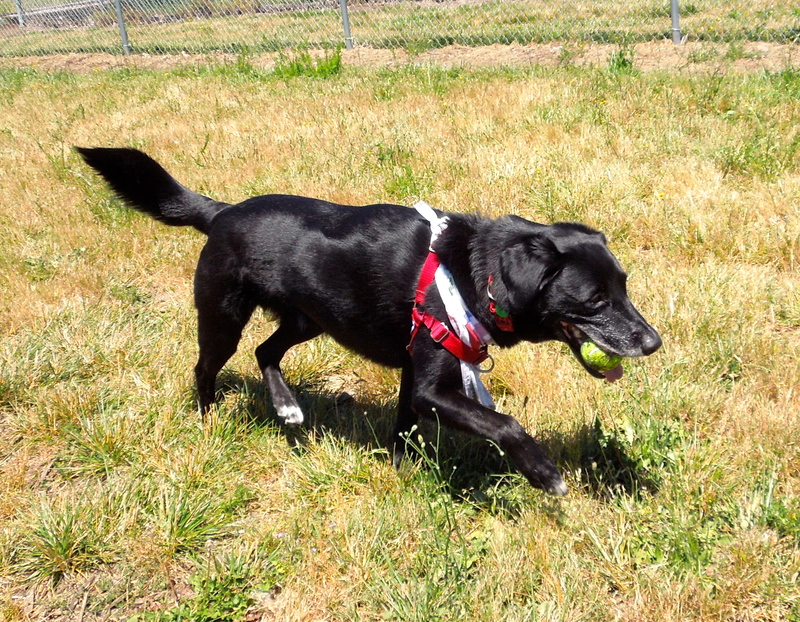 Rudy is an eight-year-old Lab mix, but certainly doesn’t act like he’s eight. 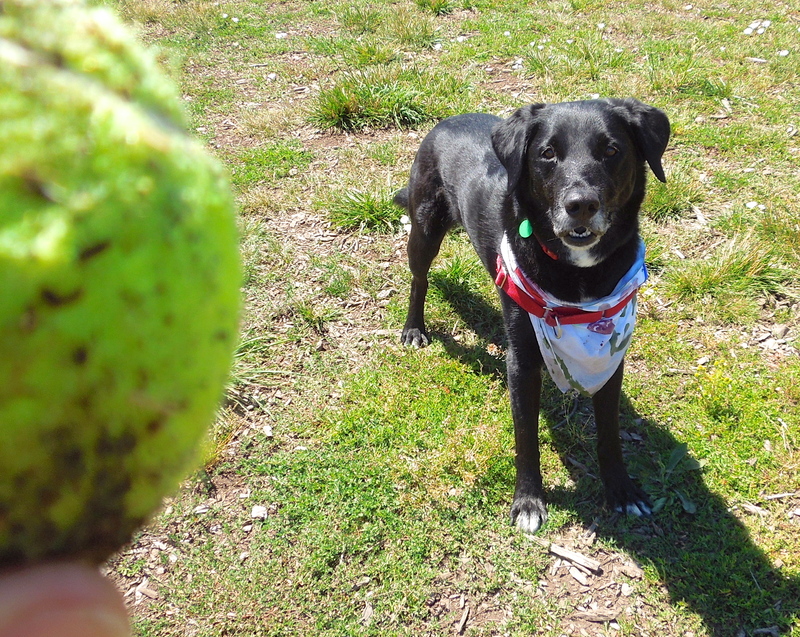 He LOVES to play fetch and Steve said he does a great job of returning the ball to you. Rudy is such a joyful dog when he gets to play outside! Here I am holding the ball just before a throw. He’s so patient! Here Rudy is with Sarah when he first arrived at WHS. I’m a Cone Dog at the moment, but I’m still happy! Liza is one of the most cheerful dogs I’ve ever met. 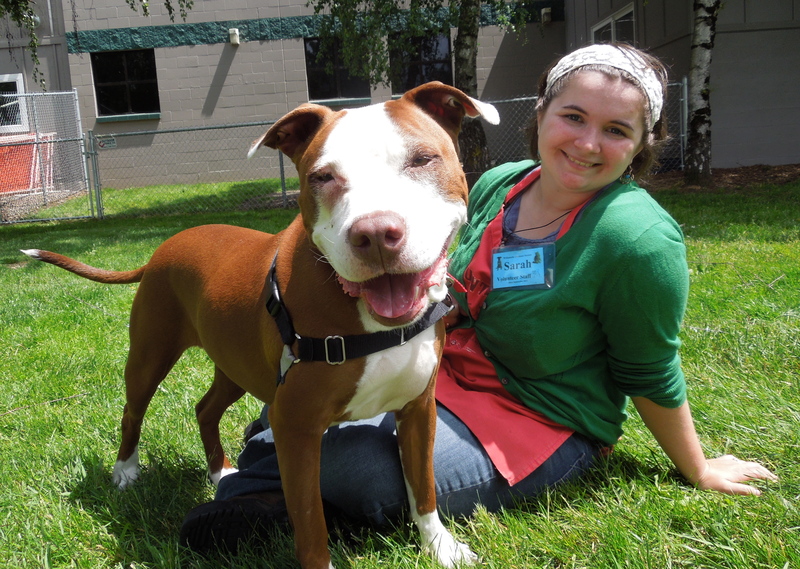 She’s a two-year-old Pit Bull Terrier mix and is a gentle, calm girl. 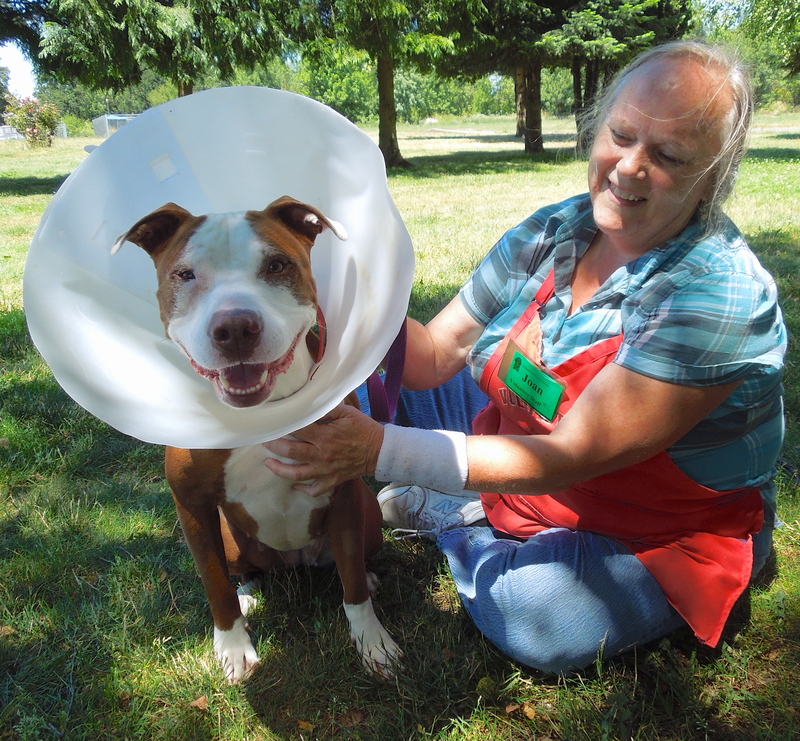 Today volunteer Joan took her out and enjoyed spending time with this sweetheart. Liza is treat-motivated and took my hot dog bits politely. She walks well on leash and is just a delight. 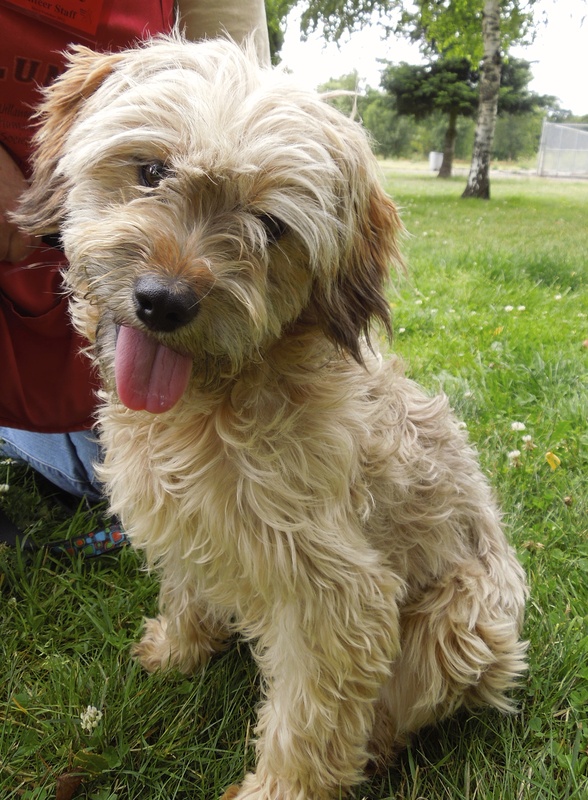 When Liza first arrived at WHS in early June, I took these pictures of her before she was adoptable. Sarah fell in love with her the minute she met her and told me I would, too. She was right. I hope she’ll find a wonderful new home soon! Can you tell that Jax is in an extremely good mood? That’s because he was one of the quarantined dogs who was cleared today to go back outside! He was one excited boy as I harnessed him in his kennel this afternoon for the first time in days. Emelynn took him out to the big yard and let him play and run and jump. He had so much energy saved up and thoroughly enjoyed his new freedom. 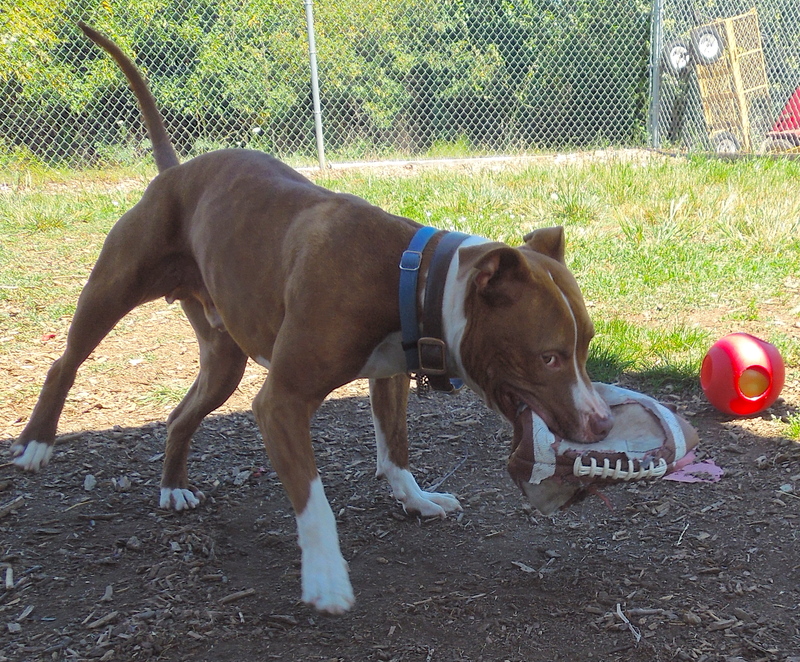 Jax is an exuberant one-and-a-half year old Pit Bull Terrier mix who is hoping for an active family. He’d make a fantastic running or hiking partner and a true best friend. I’m another Cone Dog, but smaller! When I asked volunteer Kathy to pick out her favorite dog to pose with today, she came out with Lulu, a two-year-old Lhasa Apso/Toy Poodle mix. What a charming little character Lulu is! 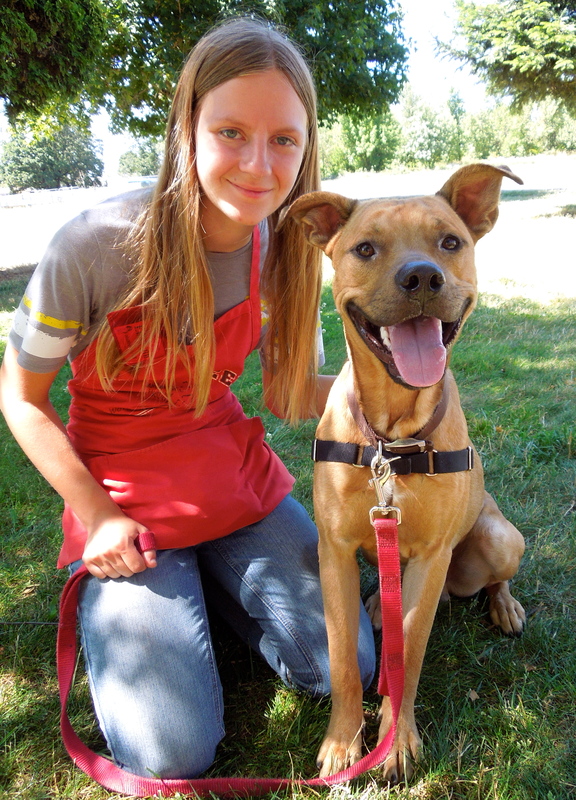 She already knows a few commands and would love to learn more in our WHS training classes. 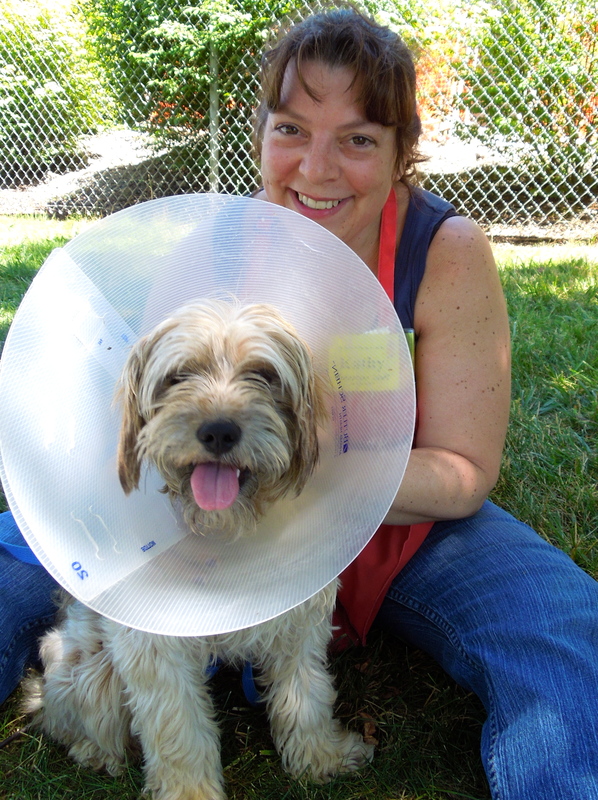 Lulu is affectionate and wanted to crawl into Kathy’s lap, though it was a little difficult with the cone. She’ll be a wonderful companion for some lucky family. Here she is cone-less last week. I’m still waiting for my perfect fit of a family! Maybe it’s yours? I spent some quality time with Gilbert this afternoon. We went out to a yard where he could rub his nose in the dirt looking for the hot dog bits I tossed toward him. Then we played a little flat football. He loved it. I wasn’t sure of all the rules, but he seemed to know them. 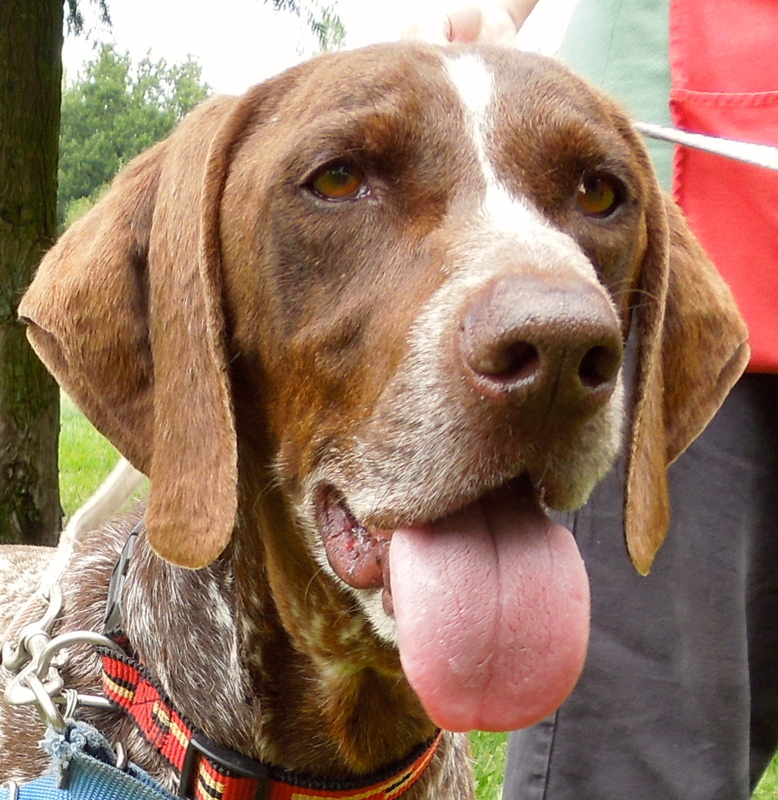 Gilbert is one of our special dogs. 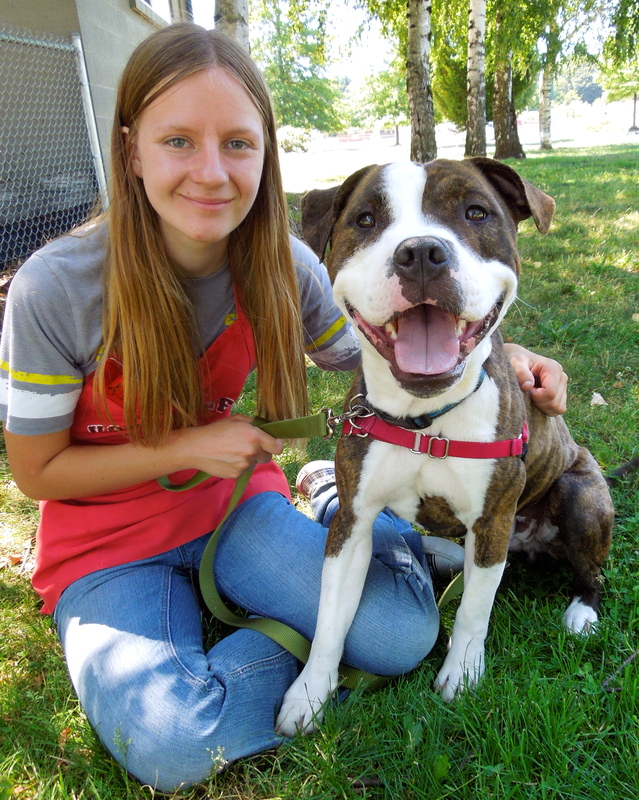 He came to us with a hurt leg, and after an operation to fix it, spent several months recovering in foster care with volunteer Jolene who fell in love with him. Gilbert does not have good kennel presentation and his leg problem will always make him walk a little funny. He is working hard on his leash-walking skills and is improving. When wearing a Halti (head halter) as I used with him today, he walks happily right by your side. 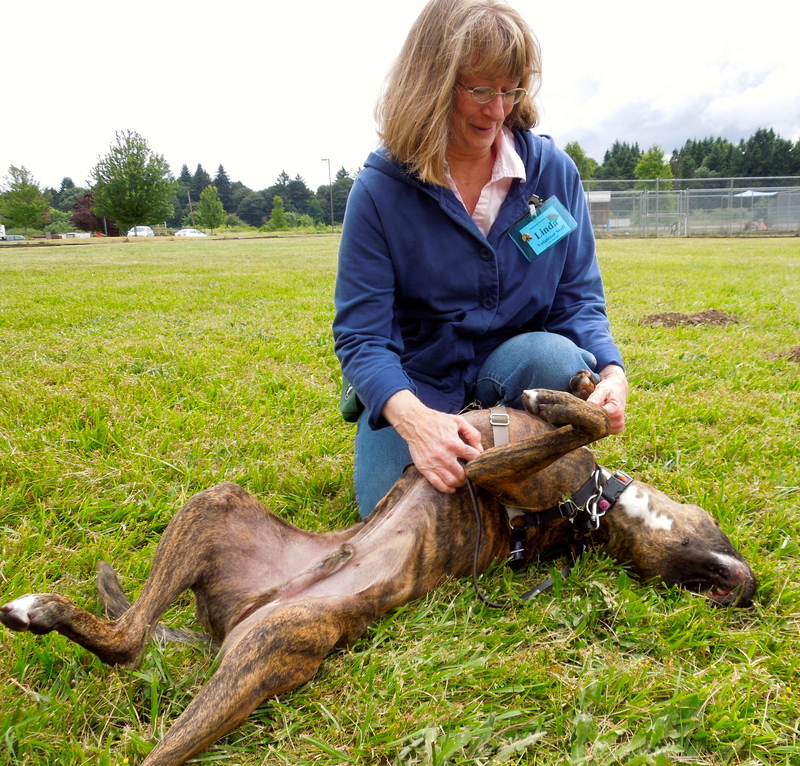 Dogs can be so different in the stresses of a shelter environment than they are in a home. Gilbert is such a dog. 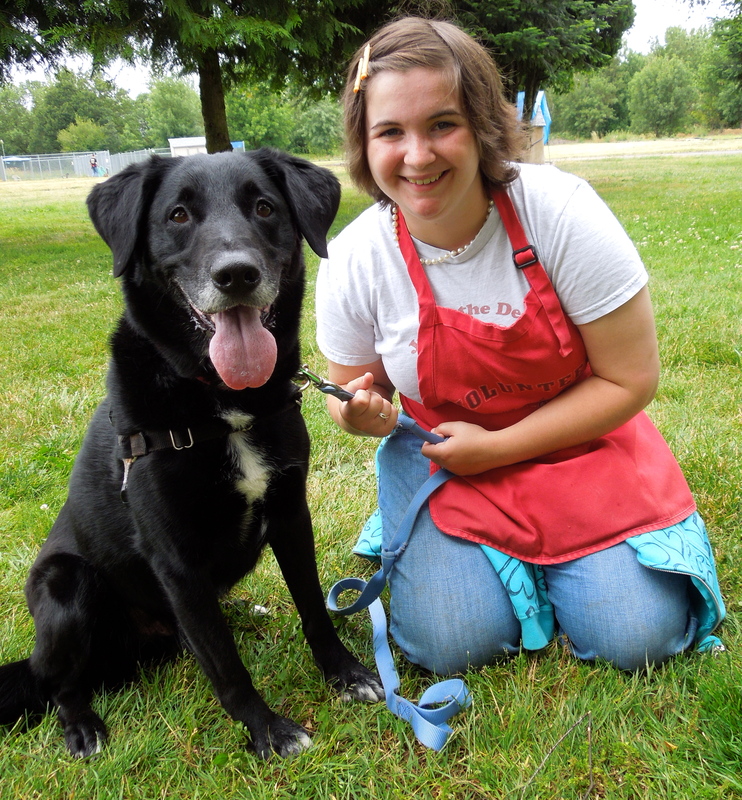 Jolene says that in a home, he is a delight and easy to live with. 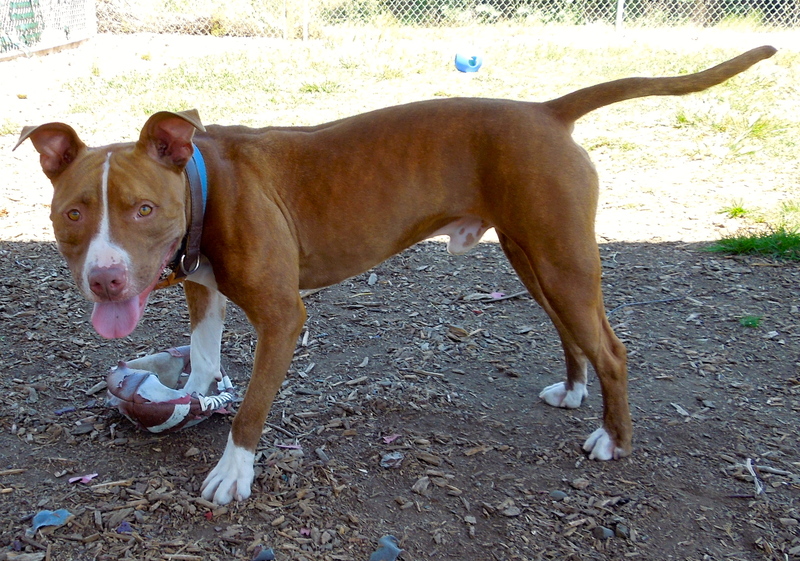 He is house-trained, loved to hang out with her other dogs, is playful and enjoys chewing on rawhide bones. He liked to play in her backyard, especially with tennis balls. I’m hoping that a family will visit the shelter and overlook Gilbert’s behavior in his shelter kennel and see the real dog he is. 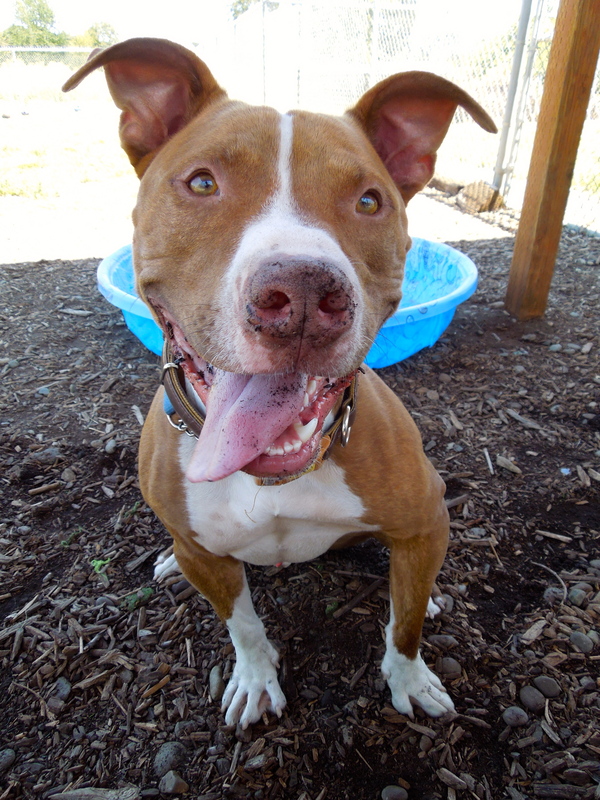 Gilbert is a two-year-old Pit Bull Terrier mix. 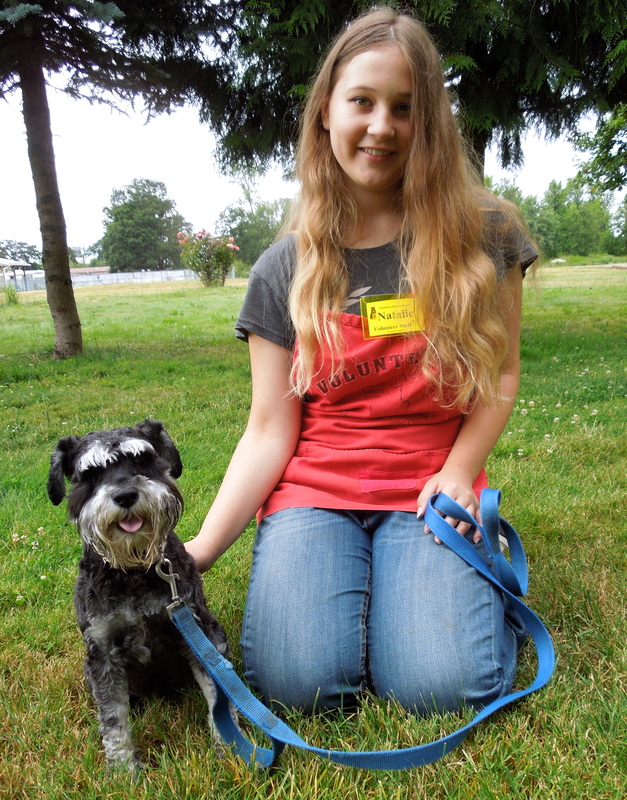 Looking for a Schnauzer? The name is Basil! Come take me home! 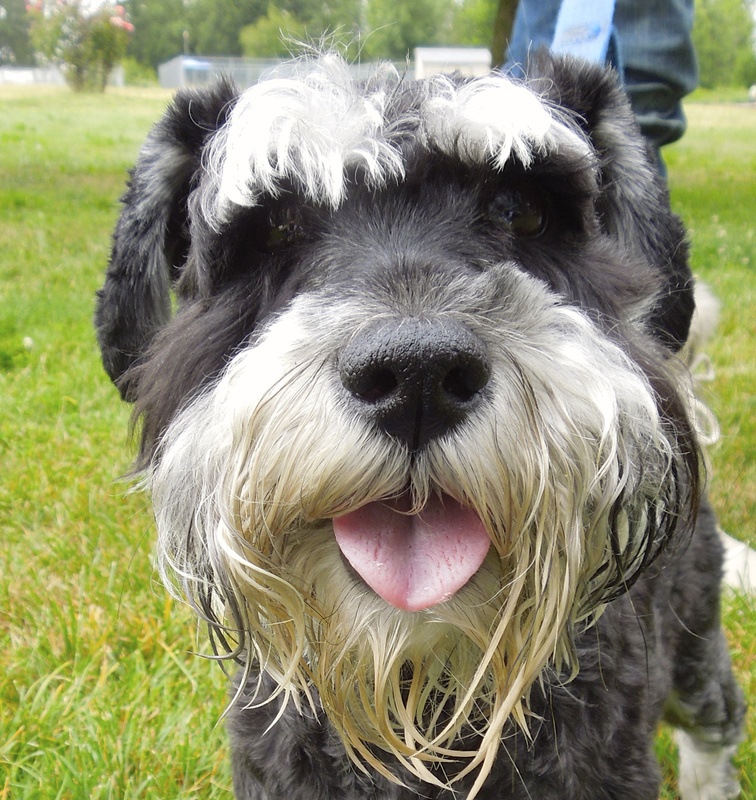 Basil is a six-year-old Miniature Schnauzer mix. He is a quiet little fellow looking for a new family to love. Here he is with volunteer Natalie. He walks well on leash, was only mildly interested in my hot dog bits, but sat anyway on command. I’m sure a Schnauzer-loving family will adopt him soon. How about adopting a big guy named Gunner? 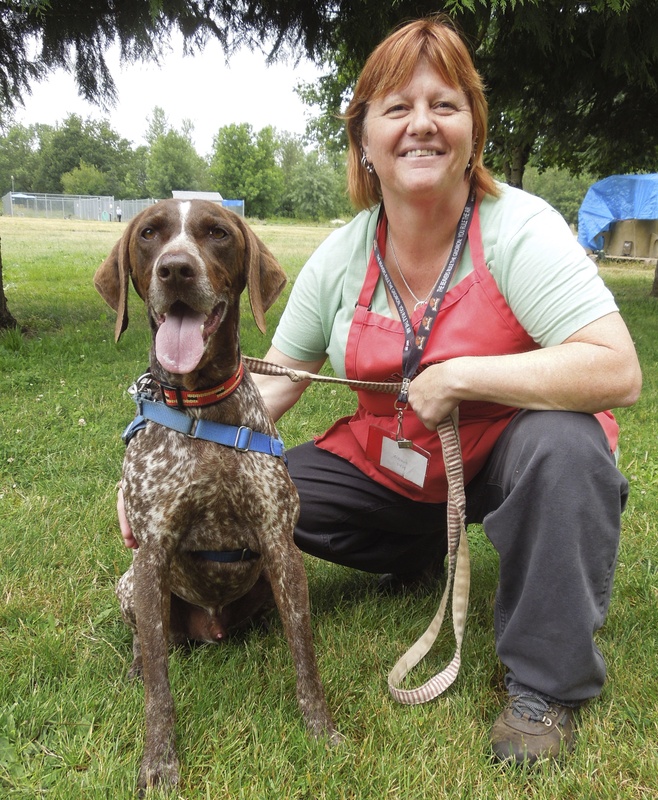 I first met Gunner, a seven-year-old German Shorthaired Pointer mix, a couple of Sundays ago and instantly liked him. He is a gentle soul, but has energy to play, and is very much a people dog. 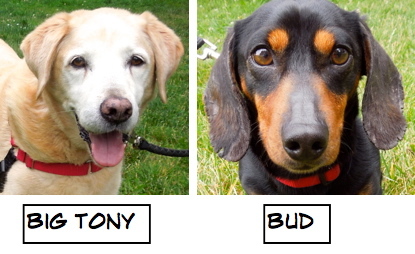 He has lived mostly outdoors, but would love to be an indoor dog, too, so he could be with his family. 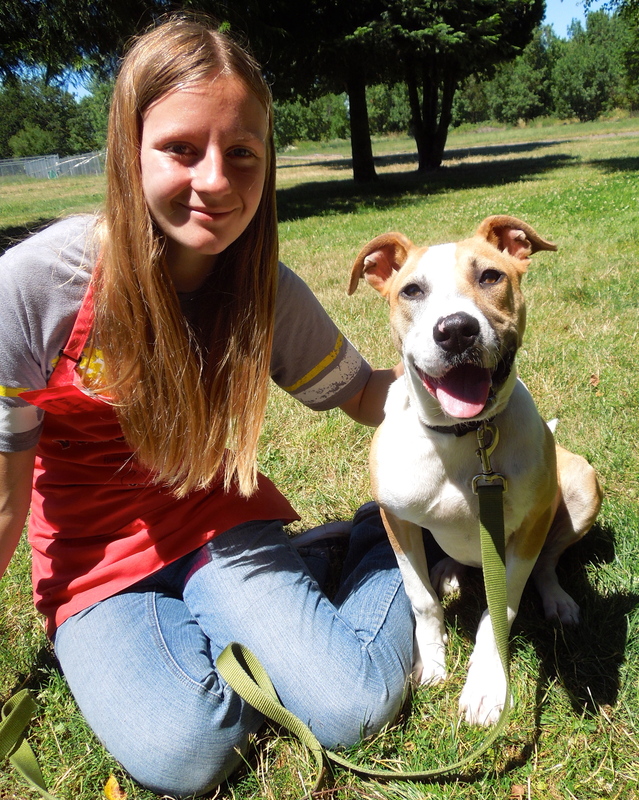 Here he is with volunteer Sherrie when he first arrived at WHS. He’s a wonderful boy. I’m finally out of ISO! Princess has been a little under the weather, and had to go to the ISO kennels to recover, but now she’s feeling just fine and this afternoon was moved back to the adoption floor. She was so excited and happy to be out and about again. She got to spend some time out in the grass with Emelynn. Princess is a seven-month-old Pit Bull Terrier puppy who is looking for a family who will teach her how to grow up to be a well-behaved dog. Her adoption package includes puppy classes to make sure that happens. What a cutie! Team Axel is making progress! 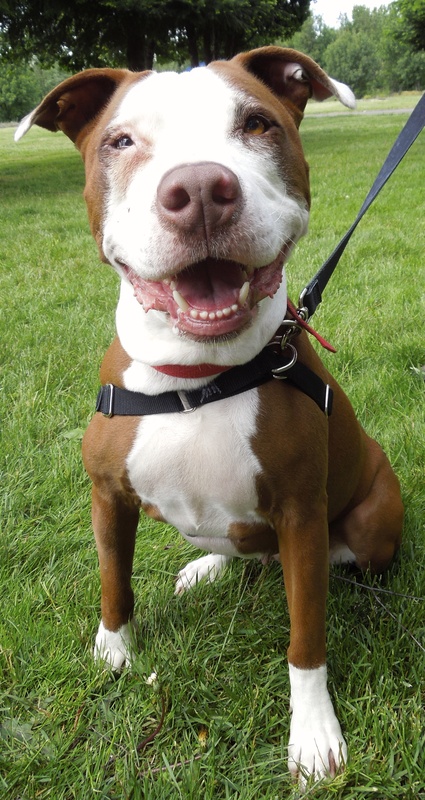 Yep, Axel has his own team of volunteers who love him and have decided to work together to improve his adoptability. We’re working on his kennel presentation, his exiting and entering his kennel without barking, his leash-walking skills and basic commands. Everyone is so impressed with his progress! He is now exiting and entering his kennel more calmly and quietly, is walking on leash more politely, and not barking as much at other dogs outside. Several volunteers not on his “team” have marveled at his improvement when they’ve seen him outside. Of course, it’s not all work for the boy. Here he is relaxing with team-member Linda. And here we are playing with his favorite ball. Team Axel is hoping that with the work we are doing with him, he’ll be adopted soon!